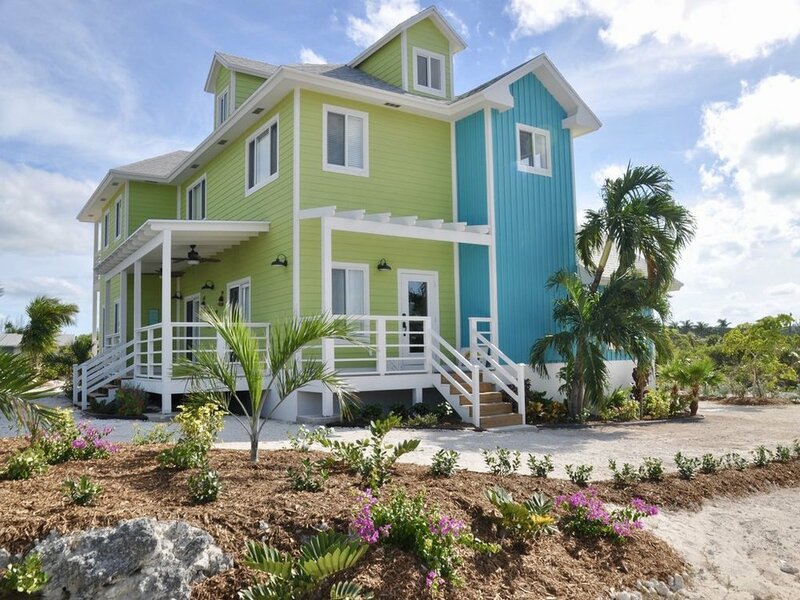 Make the most of your Exuma vacation by booking a stay in the colorful, newly constructed home aptly named Beach Blanket. Owned by model/actress Jena Sims, this 2,600 square-foot house offers four bedrooms, three-and-a-half bathrooms, and three outdoor seating areas. Perfect for families, small groups, or individuals looking to relax in spacious comfort, three of the bedrooms offer Queen-size beds, while the fourth room has two Twin-size beds. The Master bedroom is located on the main floor with an en-suite bath (shower only) and a sliding door leading to a porch. Upstairs is a second Master bedroom, which features a private balcony and an en-suite bath with double vanities and separate shower and bathtub. The additional upstairs bedrooms share another full bath that also has a separate shower and tub. Beach Blanket is located on Sandy Lane, nicely landscaped and just 200 feet from the sparking, turquoise waters lapping the shoreline at Jimmy Hill Beach. Enjoy the three-mile stretch of beach for sunbathing, snorkeling, and long, lazy walks. Paddle boards and other floating toys are available at the house for guests to enjoy. Prepare a delicious meal in the bright, well-equipped open kitchen, which features stainless steel appliances, including a dishwasher and ice-maker. A separate wet bar with mini fridge is located just off the kitchen—perfect for evening drinks! Gather in the living room with its ample array of comfortable seating and a nearby half-bathroom. There is also an outdoor gas grill for cooking in the fresh sea air. The house further offers a washer and dryer, vacuum cleaner, cleaning supplies, kitchen utensils and provisions (including spices and condiments), a coffee maker, and a toaster. Exuma International Airport is just a few minutes from Beach Blanket, and George Town is only 15 minutes by car, making it easy to discover local shopping and dining. There’s lots to do on the beautiful island of Great Exuma, including fishing, snorkeling, scuba diving, kayaking, visiting the famous swimming pigs, and touring the Exuma Cays. As the island is only 37 miles long, you can explore by car all day at your leisure and be back in time for dinner. Take a water taxi across Elizabeth Harbor over to Stocking Island for lunch or drinks at the lively Chat ‘N’ Chill beach bar, sample a variety of local cuisine at the Fish Fry food shacks, and be sure to watch the sunset at least once from Catch a Fire grill.